The Nashville City Paper reports that Ayundando Ninos (Helping Children), a "program created to help families of children with disabilities between the ages of 6 weeks and 3 years of age," has experienced extraordinary demand and is in need of funds, and a fund-raising task force has been formed. "The program was developed to seek out Hispanic infants and young children at risk for disabilities and provide them with developmental testing. Ayudando Ninos currently serves over 40 children," and demand is expected to double. Yuri Cunza, President of the Nashville Area Hispanic Chamber of Commerce (NAHCC)*, stated that an expected $30,000 grant fell through, forcing Ayudando Ninos to lose one of their intructors and suspend the treatment of a dozen children under their care. Responding to the task force's call for funds, the NAHCC will waive the regular admission to its June 30th mixer, and Fiesta Azteca will donate 15% percent of all purchases during the mixer to Ayudando Ninos. "A joint venture between McNeely Pigott & Fox and Hispanic Marketing Group has won a maximum $1.5 million contract to provide advertising and related services to Nashville Electric Service." "'We have a greatly expanded our communication and our outreach to the Hispanic customers because there's such a growing base. We have so many Hispanic customers in our service area now,'" said NES spokeswoman Teresa Corlew. "One of the bidders was Ibis Communications, which had held the NES contract for the past 10 years." "When the owners of La Lupita Mexican Store arrived at their store on Sunday morning, they found swastikas and broken glass surrounding the building. The Blount County Sheriff's Office is investigating." "'We know there's more of a good community than a bad community. It may hurt us today, but tomorrow, we'll be O.K.,' said [owner Yurisan] Cornejo." The Nashville City Paper reports that Frankie J., formerly of the Mexican-American group the Kumbia Kings, will headline the Latium World Tour's visit in Nashville tonight at Dancin' in the District. The Latium World Tour features English-Spanish bilingual artists with mainstream followings. "'I had plenty of friends telling me I was crazy, and the guys in the band were saying wait another year or two and let's keep riding this thing out,' he said. 'But I always loved R&B and wanted to make a dent in that market. There were many people saying, 'There's no way that a Latino will be accepted by the urban audience, and you're making a huge mistake.''" "But Frankie J. 's immediate and sustained success has proven the detractors quite wrong. He's now headlining the Latium World Tour along with Baby Bash and Natalie, which comes to town today at part of the Bridgestone Dancin' In The District concert series. The Latium Tour is noteworthy in that it's not only a full spectrum concert event featuring each performer backed by a large band, high-tech video production and dancers, but it's also a show featuring Latino performers that have large audiences among English and Spanish-speaking audiences. There's a marketing agreement in place with Si TV, the only English-language Latino television network, that provides cross-promotional events and online marketing." Where: Riverfront Park, 100 First Ave. N.
Please mark your calendars for our next Nashville Area Hispanic Chamber of Commerce Business After Hours on Thursday, June 30th at Fiesta Azteca (2212 Elliston Pl., Nashville, 37203 - (615) 340-0787) from 5:30 pm to 8 pm. Our apologies to members who have received an earlier notice indicating that our June mixer would take place on June 23rd. We look forward to seeing you on June 30th. NewsChannel 5 reports that "Brentwood and Metro police ... found 105 pounds of marijuana, as well as cash and guns, ... [and] say six people were working together to bring the drugs out of Mexico and to street-level dealers here in Nashville and Brentwood." "Meharry Medical College is sending a delegation of experts to a national symposium on health care disparities to be held June 11." "The symposium, 'Building Alliances for the Elimination of Health Care Disparities' ... will focus on the concepts of collaboration, research, community outreach, management of health care partnerships and cultural diversity." WBIR-TV, Knoxville reports that in the NFL, only four Hispanic coaches or assistant coaches can be found. Tennessee's team boasts 40 percent minorities, compared to the NFL average of 30 percent. "[Tennessee Titans Head Coach] Fisher filled two recent openings created by the departure of white assistants with minorities." "Ray Sherman, who is black, took over for Steve Walters as wide receivers coach. Norm Chow, who is Asian, replaced Mike Heimerdinger as offensive coordinator." "Chow rates as one of the most high-profile, non-black minority coaches in the NFL, which has just four Hispanics, three Asian-Americans and one Samoan among its coaches." The Associated Press reported, in a story widely picked up across the nation, that the Mexican mother whose daughter was taken by the State has been granted visitation rights after over a year of legal disputes. The visitation is only temporary pending further court review. The Nashville City Paper reports that E.G. "Ed" White, a Nashville construction contractor, has developed a bilingual phrasebook to bridge communication gaps in the construction industry. "The growing number of Spanish-speaking workers on his crew has required White to communicate the best he can with hand gestures and slow, deliberate speech, which can waste precious time when there's a job to be done." "White parlayed his frustration with the language barrier into a business opportunity. He's self-published a book that helps contractors translate common construction commands and phrases into Spanish - with a Spanish-to-English version included as well." "Since the first 500 copies of Lingo Guide for Builders came off the presses a couple of weeks ago, many of White's acquaintances in the industry have been very receptive to the book, said his publicist, Brenna Davenport-Leigh, owner of Hellbender Marketing." "In Tennessee, roughly one out of every 50 people is Hispanic - or 135,669 from a 2003 Census estimate placing the state's population at 5,689,261. In the greater Nashville area, the ratio is more like three out of every 50." "The Hispanic growth rate for the 12 months starting July 2003 was 3.6%, compared with the overall population growth of 1%." "The growth rate was 3.4% for Asians, 1.7% for native Hawaiians and other Pacific Islanders, 1.3% for blacks, 1% for American Indians and Alaska natives, and 0.8% for whites." "'Looking toward the future, we see a different face of the U.S. population,' said Audrey Singer, an immigration and census specialist at the Brookings Institution. 'But I don't think that's necessarily new. It's a confirmation that this hasn't stopped or changed much.'" The Baptist Press reports that for LifeWay, the Nashville-based publishing arm of the Southern Baptist Convention, Spanish-language printed products "are [among] the fastest-growing materials in the United States." "The stories all sound alike. A Hispanic immigrant who doesn't speak any English wants to apply for temporary protected immigration status in the U.S. She can't afford the $200 consultation fee many lawyers charge to determine which forms and schedules need to be filled out and sent to which office of which branch of the federal government. So she seeks out a Spanish-speaking notario, who promises to help her file the proper government paperwork. In the process, something gets screwed up, and before long she is arrested and deported." "In Latin American countries, a notario is a type of civil attorney who has the authority of the government to verify legal documents. In the U.S., though, a notary is just a professional witness - someone with a stamp who certifies that you personally signed a form. It's a big difference - and a source of confusion that businesses who prey on immigrants mine for cash. Basically, they make legal judgments without legal training." "That scenario plays out every day across the country, according to local immigration lawyers and national advocacy groups, and among Nashville's growing Spanish-speaking population it's increasingly common. Last month, a Department of Justice attorney sent Nolensville Road business Ceja Enterprises a 'cease and desist' letter, warning it that 'any further attempts to represent individuals' in front of the Executive Office for Immigration Review and the Department of Homeland Security 'will be a violation of federal regulations.'" "Jennifer J. Rosenbaum, a staff attorney with Southern Migrant Legal Services, says one of the root causes of unauthorized immigration law practice is the lack of cheap legal services for immigrants. 'Until there are other kinds of options for people, enforcement's only going to go so far,' she says, citing the need for collaborative efforts among bar associations, private granting agencies and the government. 'I think right now there's growing recognition of the problem, but we still need to find some solutions.'" 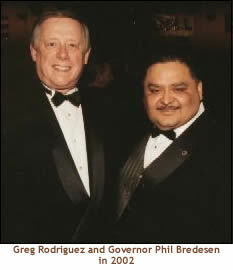 Greg Rodriguez, the President of the Tennessee Hispanic Chamber of Commerce, died on June 8, 2005. Expected guests from the State of Tennessee are Governor Phil Bredesen, Deputy Governor Dave Cooley, Commissioner Fred Phillips and others. Expected guests from the city of Nashville are Mayor Bill Purcell, Vice Mayor Howard Gentry and others. This invitation is open to the community and there is no admission. The host of the event is the Tennessee Hispanic Chamber of Commerce. The chamber extends its thanks to John Fleming and the Renaissance Hotel and staff for hosting this Celebration. Greg Rodriguez, Jr., President of the Tennessee Hispanic Chamber of Commerce, died of a heart attack Wednesday, according to the Chamber. "Nashville lost a great friend on Wednesday evening, a well-known figure, recognized by friends everywhere he went. Greg Rodriguez, 51, born and raised in McAllen, TX, moved here in 1994, has passed away from a heart attack at his home on June 08, 2005 and subsequently passed away at the Summit Hospital, in Hermitage TN." "Greg founded the Tennessee Hispanic Chamber of Commerce in 1997 and has served as the President of the Chamber ever since. He has been a pioneer in the changing of the local landscape, and his efforts have touched the lives of Nashvillians on all levels." "He always said that the most important thing for people living here is to have a good life and to simply be happy. Greg will always be known for his sense of humor and as a champion throughout Tennessee for uniting the Hispanic Community. His greatest wish was to bring his community together with a sense of respect and pride, and often asked of all Hispanics in Tennessee to work together and have pride in their community. He was also a strong advocate of more education for the Hispanic Community, and was often quoted as citing it as the most important factor for their future." Visitation will be held at Phillips-Robinson Funeral Home, 2707 Gallatin Rd, 262-3312 on Friday, June 10 (10am-4pm, 5-8pm) and Saturday, June 11 (8am-12pm). A service will be held Saturday, June 11, 1:00 pm, in the Chapel of the funeral home. The Tennessee Immigrant and Refugee Rights Coalition cancelled two planned events today in response to the news and issued this statement: "Greg was one of the Nashville Hispanic community's most valued leaders, and one of its most ardent supporters and defenders. He played many important roles in the community, including president of the Tennessee Hispanic Chamber of Commerce. We will greatly miss Greg, and he will remain in our hearts forever. His tremendous presence in the greater Nashville community is now felt as a terrible absence." Diana Holland, Owner of Hispanic Link Consulting, shared this story: "I was introduced to Greg in November of 2003, and I was offered the opportunity to volunteer to plan the 2004 Latino Awards Gala for the [Tennessee Hispanic] Chamber. I jumped on board and, for five months, worked very closely with Greg toward what ended up being a very successful event with over 450 attendees. We had many challenges along the way, especially as I sit on the Board of the Nashville Area Hispanic Chamber of Commerce and was then their Treasurer. I recall Greg saying to me, 'You have guts woman,' to which I responded: 'Well, now you know it is two of us,' and he responded with his characteristic simultaneous smile and nodding of his head. Greg always advocated for working together, and we discussed from time to time what it entailed to weave communities together. Greg: thanks for having guts and inspiring others to have them too! Hasta siempre!" Yuri Cunza, President of the Nashville Area Hispanic Chamber of Commerce, said, "We join the Hispanic Community in mourning the loss of Greg Rodriguez, founder and president of the Tennessee Hispanic Chamber of Commerce. We will remember his leadership and advocacy for Nashville's Hispanic community." Commenting on the perceived rivalry between Nashville's two Hispanic chambers, Cunza downplayed the groups' differences and noted that Rodriguez's powerful presence fueled interest in Hispanic advocacy not only among the members of his group but also those in other organizations, including the Nashville Area Hispanic Chamber of Commerce. Cunza also noted the opportunity for unity among the Hispanic community: "This is the point at which any line that once divided us now becomes very thin; this is a time in which we should be looking at our similarities and what we are truly trying to achieve. All the other things are insignificant at this point." Reports of Greg's death appeared in the Tennessean, Nashville City Paper, Nashville Post, Nashville Business Journal, and on NewsChannel 5. Why: Representatives from the academic, religious, labor, and immigrant communities will be present to applaud the introduction of the Secure America and Orderly Immigration Act of 2005, a bipartisan legislative proposal in the U.S. Congress that would provide the foundation for a saner and more enforceable immigration system. Speakers will discuss how Tennessee is currently benefiting from its immigrant population, and how current U.S. immigration laws make it virtually impossible for low-skilled immigrant workers to obtain legal entry into the U.S. Participants will also discuss why immigration policy can only be effectively legislated at the federal level, and how some current state proposals would have negative and potentially harmful consequences for all Tennesseans. Express concern that some public figures are exploiting people's fear of change to foster hatred against Tennessee's newest residents. A Nashville radio talk show host is holding a large-scale "anti-illegal immigration rally" in Nashville. This individual routinely cites statistics about all foreign-born people in America to explain overcrowded prisons, high unemployment, excessive public education costs, and the reintroduction of diseases like tuberculosis and leprosy. Please join immigrant community members and supporters in the Nashville "Unity in Diversity" event to help demonstrate that Nashville embraces its new diversity, not division or hate. The Coalition exposes the talk show host's statements here. July 2), will be of $5 per person per Saturday, including materials. "adaptation" training on how to apply for a job in the US and get hired. Relations Commission and St. Thomas Health Services. NASHVILLE – The U.S. Department of Housing and Urban Development (HUD) Nashville Field Office will team with the National Association of Hispanic Real Estate Professionals of Middle Tennessee (NAHREPMT) and the Middle Tennessee Hispanic Partnership to present Fiesta del Hogar de Centro Tennessee - Housing Festival of Middle Tennessee on Sunday, June 19, 2005 beginning at 2:00 pm at the Nashville Municipal Auditorium which will also be spotlighting a Mexican rodeo. Mr. Miguel Torres, Director of Affordable Housing Resources Hispanic Homeownership Center and President of NAHREPMT and William Dirl, HUD Nashville Field Office Director, announce the launching of the biggest Latino educational housing event in Tennessee’s history. The event is designed to promote homeownership to the Latin community and all potential homebuyers in Middle Tennessee. “This is going to be a wonderful event. Our partners are committed to bringing homeownership information to Middle Tennessee’s growing Latino community. And the fact that we have been able to partner with the Mexican rodeo, which is taking place simultaneously at the municipal auditorium means that we will be able to reach an expected audience of over 8,000 people,” said Miguel Torres. Information and registration information is available on HUD and this event on Tennessee’s website and calendar of events seen at http://www.hud.gov/tennessee or http://www.hud.gov/local/index.cfm?state=tn&topic=calendar. Officials from across Middle Tennessee are expected to attend, including local, state and federal representatives and elected officials. An opening ceremony will begin at 2:00 p.m. to show attendees that Middle Tennessee’s Hispanic Partnership, a group composed of banks, lenders, housing agencies, housing counselors, non profits and government officials, are serious about promoting homeownership to anyone who is interested. Agencies that provide down payment assistance or have creative mortgage financing strategies will attend and provide needed on the spot Spanish translation. The event will provide food, fun, festivities, children zones, and live music. Please come and join us on a Sunday afternoon in Nashville. The Nashville Business Journal reports that two professional Mexican soccer teams will play in the Coliseum in Nashville and expect to draw a crowd of 25,000. "Top-ranked Mexican soccer teams Tecos and Atlas will play at the Coliseum in downtown Nashville on July 15 and are expected to attract nearly 25,000 fans." "Azul Deportes in Louisville, Ky., is organizing the event in Nashville and a second game to be played in Charlotte, N.C., at the Bank of America Stadium on July 17. The games are named Clasico Zapopan 2005." "Standing on the Epcot Center stage after receiving his Disney Dreamers and Doers award, Walter Menjivar showed why he was worthy of it." "The Mount Dora High senior used the opportunity to put in a pitch with Disney executives for free theme-park passes for homeless kids with whom he works at Anthony House, a Zellwood shelter." "Walter has been volunteering steadily since he was in eighth grade. He is bilingual, so he often teaches English to Spanish-speaking children. He has helped win a grant for two vans at Anthony House, appealed to local officials for support and attendance at homeless-shelter functions and asked businesses for contributions." "Walter's family is from El Salvador. His mother, Maria Shenk, moved to Florida from El Salvador the year before Walter was born." "In addition to winning the Disney award, Walter has won many scholarships because of his volunteer work. They will cover the cost of his undergraduate college years. He plans to attend Vanderbilt University in Nashville, majoring in human organization and development." NASHVILLE, Tenn. (BP) - The 18th Annual Reunion of the National Fellowship of Hispanic Southern Baptist Churches, encompassing various meetings and events prior to the SBC annual meeting in Nashville, will begin with a simultaneous evangelistic crusade across Tennessee. Saturday, June 18, hundreds of volunteers from Hispanic churches across the country will join in the Crossover Nashville evangelistic thrust. That evening, Hispanic fellowship participants will begin gathering at six at Tulip Grove Baptist Church, 563 Shute Lane in Old Hickory, northeast of Nashville, for registration, fellowship, music, worship and praise, and time for participants to view exhibits from different ministries and sponsors. A mega-concert and worship celebration, with the theme “I Will Seek Your Face,” will follow from 7-9 p.m.
Sunday morning, June 19, fellowship participants will worship in Nashville-area Hispanic churches, followed by a session at 1:30 p.m. featuring various conferences led by Hispanic leaders. The program will continue from 3-5 p.m. with a business session. Fellowship President Heberto Becerra, pastor of First Hispanic Baptist Church in Plantation, will preside. Sunday night from 6-8 p.m., the 8th Annual Church Planting Celebration sponsored by the North American Mission Board will be held at Haywood Hills Baptist Church, 255 Haywood Lane in Nashville. For additional information, contact the organization’s executive director Julio Fuentes at 305-206-7575 or julhist@aol.com. "A Heart-to-Heart Conversation on Culture, Race and Difference" screening of the documentary "The Way Home" written and directed by the filmmaker, Dr. Shakti Butler, in Oakland, California. This workshop is designed to engage in conversation women who are interested in exploring issues of race and ethnicity as they intersect with gender, class and difference. The film provides viewers the opportunity to glimpse intimate conversations within groups of women representing various cultures and ethnic groups such as Asian, Arabic, African American, Jewish, Latina, Native American, White, and those of Mixed Race, who came together to engage in a heart-to-heart talk about how their life is impacted by the racial issues of American culture. A discussion will follow the screening. The Student Life Center is located near the corner of 25th Avenue South and Vanderbilt Place. There will be signs posted along 25th Avenue South directing workshop attendees to the complimentary parking location. The workshop and accompanying brunch are free of charge, but it is requested that those interested in attending please contact Ms. Emmy Hubbard at (615) 322-6400 or emmy.hubbard@vanderbilt.edu to reserve a space at the workshop and notify her of special dietary or physical accommodation needs. "A Heart-to-Heart Conversation" promises to bring Nashville's women together in a unique way to explore issues of race and ethnicity, and will, hopefully serve as a catalyst for building bridges.